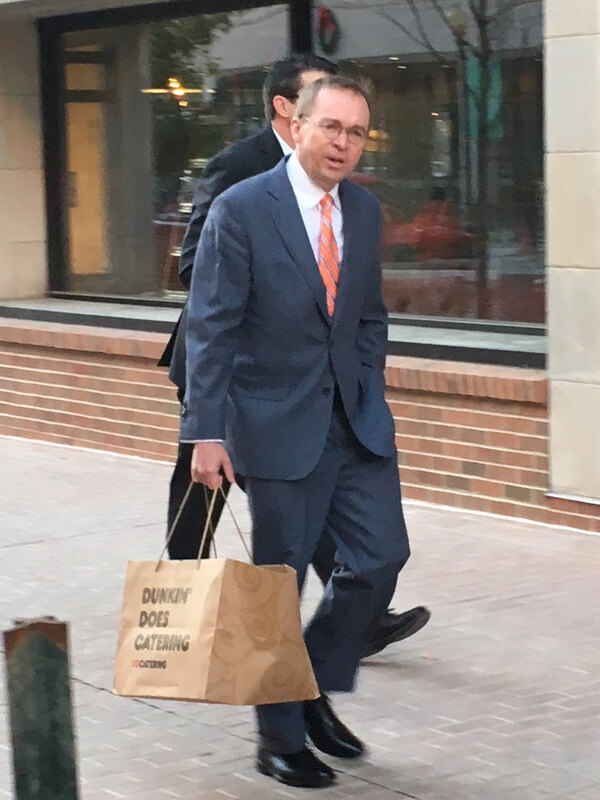 White House Budget Director Mick Mulvaney showed up for work at the Consumer Financial Protection Bureau across the street from the Old Executive Office Building in Washington at 7:20 on Monday morning, with a large bag of donuts in hand and minimal security. 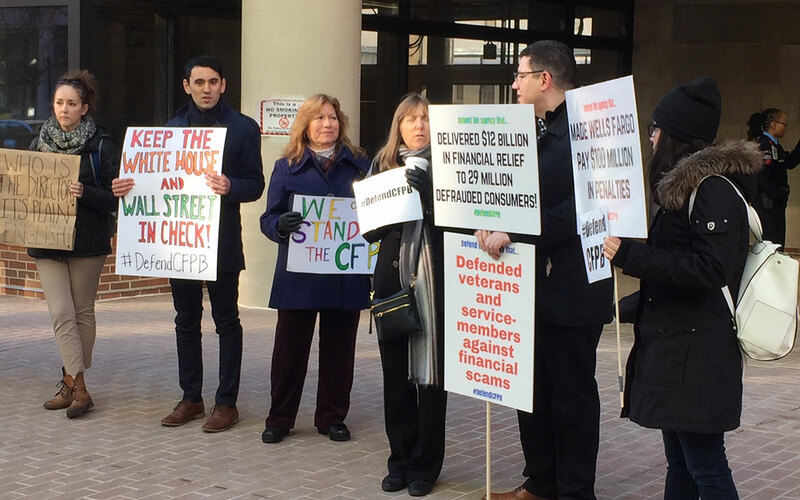 He was greeted by a handful of protesters from a consumer activist group called DefendCFPB, following a weekend of legal back and forth between the Trump administration and some—but not all—of the consumer agency’s staff. The continuing clash was triggered by the surprise decision by Director Richard Cordray to accelerate his previously announced departure and leave on Friday. This prompted the bureau to announce that the new acting director is Leandra English, the agency’s chief of staff who has held several positions at the politically controversial bureau since she helped stand it up in 2010. “Leandra is a seasoned professional who has spent her career of public service focused on promoting smooth and efficient operations,” Cordray said of the veteran of the Office of Management and Budget and the Office of Personnel Management. 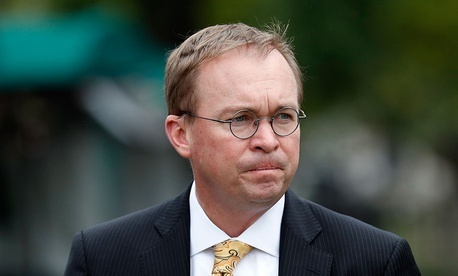 But the White House responded by confirming earlier news reports that President Trump was asking Mulvaney, a longtime critic of the bureau during his days as a Republican congressman from South Carolina, to temporarily double up running both the CFPB and OMB. A White House statement on Saturday said Mulvaney can be named as acting director under the 1998 Federal Vacancies Act, which it said takes precedence over the provision in the 2010 Dodd-Frank Financial Reform Act that stipulates that the bureau's deputy director becomes acting CFPB director in the "absence or unavailability of the director." English, in her first major move in her new, if disputed, job, on Sunday filed suit in U.S. district court seeking injunctive relief against Trump and Mulvaney, calling herself “the rightful, acting director” of the bureau and seeking a fast resolution. Sen. Elizabeth Warren, D-Mass., considered the brains behind the original proposal for creation of the bureau, sent fundraising appeals over the weekend recalling that when Mulvaney was once asked what changes he'd like to make to the CFPB, he replied: "Well some of us would like to get rid of it." As the legal debate continued pending action by the district court, former Rep. Barney Frank, D-Mass., one of the chief authors of the law that created the bureau, acknowledged to MSNBC that drafters “could have been more specific” in writing the law to make it clear that the internal secession language for the independent agency replaces the language of the Vacancies Act. At Monday’s White House briefing, press secretary Sarah Huckabee Sanders, said, “Mulvaney has taken charge of that agency and has the full cooperation of staff. Things look very well on his first day.” Under questioning, she added that “Consumers should be glad to have a leader of the agency who actually fights for consumers,” alluding to the departed Cordray’s undeclared plans to run for governor of Ohio. The White House on Monday released a detailed statement on its legal case, saying the Obama administration took the same position as this White House in the case of a similar vacancy on the National Labor Relations Board. This story has been updated with comments from a White House press briefing and other observers.